I am relatively new to Blogging and I hope to learn more as I go. My plan is to document my training both in my professional and personal life and add some milestones or family moments that are important to me. 2009 has been an epic year for me and I wish that I had started this earlier but a new year has begun and who knows what it will offer. Stay in touch and we'll find out together. Today was our last Sunday of training before event day. We started on the Parau Track near Cornwallis, about 12kms. Still muddy and slippery but also filled with laughter. We feel ready for event day, not in an athletes sense, I'd imagine, but with the confidence that we will complete the distance within the required time. I have training with Mike, Marion and Ann tomorrow, out with the Sharons to do 3x volcanoes on Wednesday and Saturday and one more session with Mike which will mark the end of a 3 month training programme. Our aim, to climb the sand dune as fast as we could - Great training! I'll let you know how we go. REALLY looking forward. I hope to be back soon to give you our update. My training is on track for Northburn Station Ultra Marathon. A month since my last Blog update I have managed to stay on track. 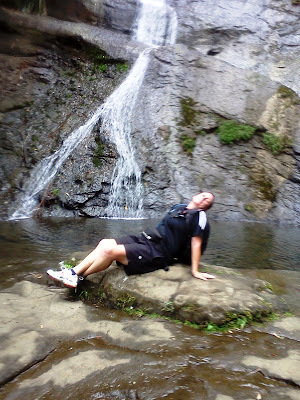 Our Wednesday hikes up the volcanoes of Auckland has increased from 3 to 4 now that we have added One Tree Hill. Slowly but surely I am able to run up most of them now. Saturday, we are now doing 5 volcanoes. We start by walking/running from Mt Eden to One Tree Hill then on to Big King followed by Mt St Johns, Mt Hobson and then back to Mt Eden to run up to the top. I can't quite run to the top of it yet without a walk but getting close. Sunday, we join the girls, Michelle, Cheryll and Denise and head off into the Waitakeres to tackle some tracks. The hardest by far has to be the one that we did last Sunday Te Toiokawharu as it was so wet from all the rain and dangerously slippery. It was a tough weekend as I really didn't want to get up early and get going but it had to be done. Thankfully, we survived! I try to keep up with my training on Thursdays with Mike but had to miss last week. Looking forward to this week though. I have to say, there are some amazingly beautiful places to visit in Auckland and I'm enjoying getting out and about. My training has well and truly begun and it seems easier to get out for runs, at least at the moment. At the start of last week, Shayne and I went along to watch the tennis with one of the companies that works with Shayne and we were wined and dined for the evening. Nice food, endless drinks and great company. A big test for me as I could have drank what I wanted but needed to stay focused and had water and one glass of bubbles. No exercise for the day though as work commitments and tennis took priority for the day. Last week also saw my mother in-law's 70th birthday in and we celebrated in style. I restricted my alcohol in-take to just one glass of bubbles, a big test of my will power! It was a tough one as I had so much to do today before I head back to work tomorrow and I have a full-on busy week ahead BUT I managed to exercise my Will Power muscle. I wanted to go for a run with my son, Luke, only 6kms, but as the day progressed and I still had lots to do, nothing was further away from my mind than a run and in all this rain that we have been having here in Auckland. Exercise my Will power: Despite the rain, Luke and I left home at 5:00pm and drove to the Pipe Line to run the 6kms we really didn't want to do BUT we did it! Happy 2012! I hope that you have made some New Year Resolutions to aim for. I have and I plan to show you through my Blog how I am going with it. I will test my Will Power every week with my training and try and give myself goals to see me through the year in terms of my fitness. In March I hope to complete my first Mountain Run event in the South Island and will be training for that which is just before the Rotorua Marathon. I want to do this event this year followed by the Gold Coast half marathon. Beyond that, I'm not too sure just yet but I will fit something/s in before the end of the year. 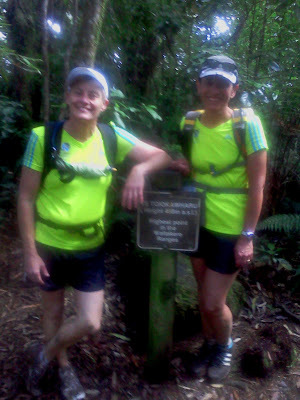 So far I have been for one little 6km run and went out with my buddies, Sharon and Other Sharon, to walk up One Tree Hill, Mt Smart, Mt Hobson and Mt Eden (in the rain!) and it was a tad tougher that normal given that we haven't done too much since Christmas. Stay with me to see how I exercise my will power muscle and get myself back into shape. Feel free to join me on runs/walks. Exercise my Will power: I got up at 6:00am and left my house at 6:30 to join the Sharons on our walk. I haven't had to get up early all over Christmas and so it was EXTRA hard today BUT I did it! What a day! Up at 3:15am this morning for the early preparations for the marathon. I started with breakfast, toast with peanut butter and mashed banana and wanted to have rice pudding and cereal too but I couldn't face it. I also didn't want to drink anything to avoid toilet stops later on. I wasted 11 minutes last year queuing up for the toilet! We left the house at 4:00am to pick up some like minded friends. Shayne kindly dropped us off in town to get the ferry to Devonport. No queues, just straight onto the ferry and over. The time went quick as we stood around chatting and then headed to the start line. My friends moved forward towards the start line while I meandered to the back just before the walkers' sign. I spotted my sister in-law in the crowds and joined her and Cheryll. We waited together. We were off! 6:10am we edged our way forward. I had to stay positive for as long as possible and this seemed easy all the way until about 8ks to go. A lady came up alongside me and asked how I was going. She was from Canada and we chatted for a while until she pulled back with a sore knee. Out of all the people there running with me, she was the only one that spoke to me and I couldn't help but think it was Philomen's way of letting me know she was with me. Goose bumps! That gave me the boost I needed until I reached the last 4ks. Donna, Shayne's cousin, was in her spot to cheer me on which got me to the end. The last 1.5ks I was met by some of Shayne's work colleagues sitting at a cafe. They cheered me through which gave me the strength to finish in style. I couldn't have run any further. Today, I feel that I ran my heart out. It wasn't the fastest marathon but it was my MOST determined effort and I feel proud of myself. 4hrs 21mins. MUCH better than I thought and I am VERY happy. Just a quick note to let you know that the Auckland marathon is on Sunday and I am still planning on doing it at this stage. My training has been poor but I managed a 32k run with others and got through it ok although was dehydrated and it took me the day to recover! Since then I have done a few little runs, my usual Saturday walks with the girls and Mike the trainer, on Thursdays, although I missed last week. Not enough running training and so it will be a hard one. I just want it DONE now and then I can move on and start afresh. Not sure what to do next, perhaps the Rotorua Marathon. I need to try and get out for more runs though. If anyone has any suggestions on other events, please let me know. So far I am thinking about the Kerikeri half marathon and the Cathay Pacific half.